I've previously posted a recipe for Quinoa Tabbouleh (click here) and whilst I still enjoy that recipe, I wanted to post another version as tabbouleh is perfect for sunny weather and it's always nice to have a little variety! Despite its name, buckwheat is naturally gluten free and is an ingredient which features prominently in my kitchen. It may not have quite as many nutritional benefits as the powerhouse that is quinoa but it's nice to offer as something a bit different. This salad has been my go-to for lunch recently and my boyfriend has even said that it's his new favourite- high praise indeed! I'm not going to deny that it's pretty garlicky but it is balanced by the fresh flavours of the other ingredients including classic tomato & cucumber, jewel-like juicy pomegranate and a trio of herbs. What's more, when I have this for lunch, it's so satisfying that I feel full until dinner without the temptation to snack. The recipe can be made in bulk if you need a slightly unusual salad to take along to a BBQ and it also keeps pretty well in the fridge, making it perfect for meal prep. 1) Combine the buckwheat groats and vegetable stock in a saucepan and simmer together (stirring regularly) for 15 minutes over a medium heat on the hob, until almost all of the stock is absorbed. Place a lid on the saucepan, reduce the heat to low and cook for a further 5 minutes until all of the liquid is completely absorbed. Set aside to cool completely. 2) Add the remaining ingredients and stir together to combine. If you've spent any time scrolling through foodie accounts on Instagram, then you'll be all too familiar with the oh-so-grammable acai bowl. Acai bowls are essentially a smoothie bowl based on the Brazilian super fruit, which has a deep purple colour. 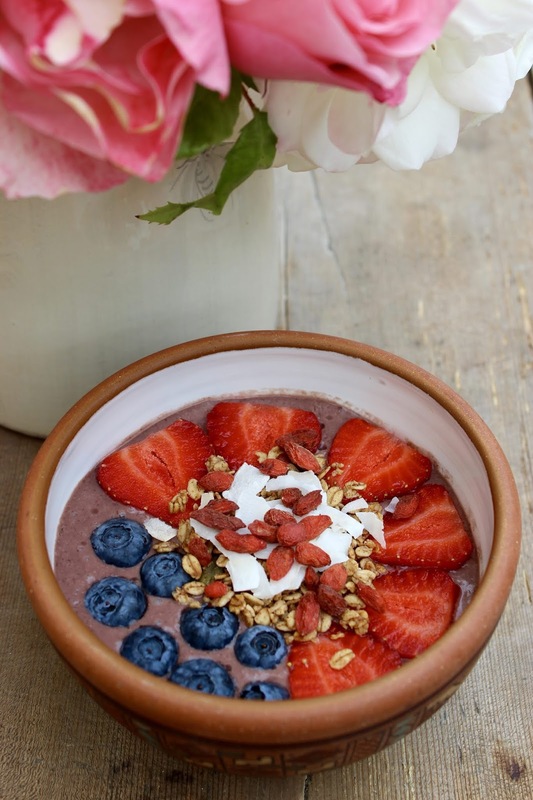 As with any smoothie bowls, they're the perfect summer treat, whether it be for breakfast, a post gym snack (ideal following a HIIT workout thanks to the powerful free radical fighting antioxidants) or dessert. The following recipe is so easy and of course, you can adapt it to your taste- for example, reducing the liquid quantity if you prefer a thicker base and alternating the toppings for your favourites or whatever you have on hand. However you decide to enjoy this recipe, don't forget to Instagram your creation (otherwise, is it even an acai bowl?!). 1) Place the acai, banana and coconut milk in a blender and blend until smooth and creamy. Pour into a bowl and add the toppings. I've wanted to share a recipe for Turmeric Hummus for some time now and I'm not entirely sure what's taken me so long! I've previously mentioned that I eat a lot of hummus and whilst I'll come back to Classic Hummus (recipe here) time and time again, it's also nice to switch things up by featuring other flavours. I most recently made this as part of a special dinner I prepared for Fathers' Day, when the weather was grey & miserable so I wanted to add some sunshine to the proceedings, which the colour of this certainly does whilst the hummus also packs a flavour punch! 1) Place all of the ingredients in a food processor and whizz together until smooth and creamy. I love taking everyday, readily available vegetables and creating recipes based around them to provide inspiration for new ways to serve. Hopefully it helps liven up mealtimes and makes it that little bit easier to incorporate your 5 a day (or more!). 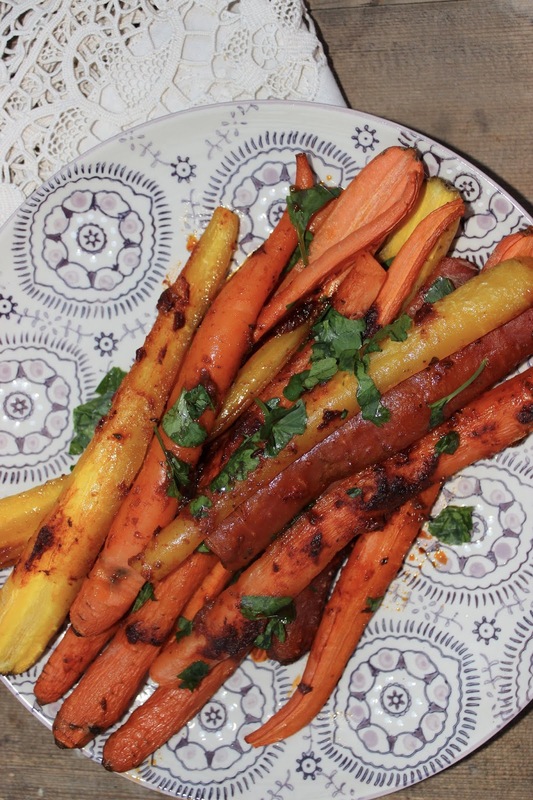 This recipe features harissa, which I can't get enough of at the moment, to add interest to carrots. I've opted for rainbow carrots but feel free to use regular. 1) Preheat oven to 200 degrees C. Chop the carrots in half lengthways. 2) Toss the carrots together with the coconut oil and harissa paste in a roasting tin, ensuring they are evenly covered. Roast for 40 minutes until cooked through. 3) Place on a serving plate and sprinkle with the chopped parsley. Enjoy immediately. Baked Avocado Fries may sound like the strangest thing but I promise that once you try them, you'll be hooked! They're the perfect "junk" food (with a healthy twist of course!) for enjoying alongside the World Cup... or not, if you prefer your food without a side of the offside rule. Even my usually cynical boyfriend and dad love these! They taste seriously indulgent and are crispy on the outside, encasing creamy avocado and are perfectly accompanied by the spicy roasted tomato salsa. 1 large ripe but firm avocado, peeled, stoned and chopped into thick "fries"
1) Make the salsa in advance. Preheat the oven to 180 degrees C.
2) Place the tomatoes, onion, garlic and chilli in a roasting tin. Drizzle with the olive oil and season with the salt & pepper, making sure that all of the ingredients are evenly coated. Roast for 30- 40 minutes. Remove and set aside to cool. 3) Prepare the avocado fries. Preheat the oven to 200 degrees C. Line a baking tray with a silicone mat or baking paper. 4) Place three bowls in a row. In bowl one, place the chickpea flour and season with salt & pepper. Mix together with a fork. In bowl two, whisk together the almond milk and olive oil. In bowl three, combine the polenta, nutritional yeast and cayenne pepper. 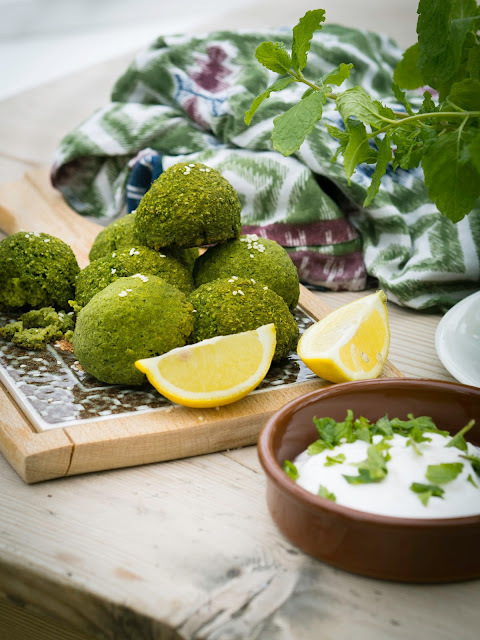 5) Dip the avocado "fries", one at a time, into each of the bowls, starting with bowl one with the chickpea flour, followed by the milk mixture and finishing with the polenta combination. Place the prepared avocado "fries" on the baking tray and bake for 20 minutes (until golden), turning halfway through the cooking time. 6) While the "fries" are cooking, place the cooled salsa ingredients into a food processor along with the coriander. Whizz together to combine and then pour into a serving dish. Time to fess up... I never actually used to like gazpacho. Don't get me wrong, all of the ingredients appealed to me but I simply couldn't get my head around the concept of "cold soup". Of course, the climate in Andalusia, Spain where gazpacho hails from, is somewhat warmer than where I grew up so perhaps that had something to do with my failure to grasp the concept too. I started playing around with recipes for it when my boyfriend told me how much he enjoys gazpacho and in turn, it led me to rediscover the soup. For obvious reasons, this version omits the bread and optional egg, which some classic recipes include but you won't miss them as this gazpacho is so packed full of fresh flavours and goodness. My boyfriend has stated that this is one of his favourites of all of my recipes and I must say that I love serving it for a light lunch, starter or dinner on a hot day. I hope that you will try it whether you're a long time fan of gazpacho or need convincing, as I did! Now we just have to cross fingers for sun! 1) Place the tomatoes in a medium bowl and cover with boiling water. Set aside for 5-10 minutes. (This step will make it easier to peel the skins off the tomatoes.) Peel the skins from the tomatoes and place in a blender. 2) Add the red pepper, cucumber (leaving 1/4 to one side for later) and red onion to the blender and blitz until blended together. 3) Add the garlic, olive oil, apple cider vinegar and salt & pepper and blend until smooth. 4) Refrigerate to chill until needed. To serve, sprinkle with the remaining cucumber as "croutons" and drizzle with a little of the olive oil. I regularly reach for smoothies as a quick breakfast at this time of year and whilst I have my go-to recipes which I can make practically without thinking, it's also nice to switch things up & experiment with new flavours. 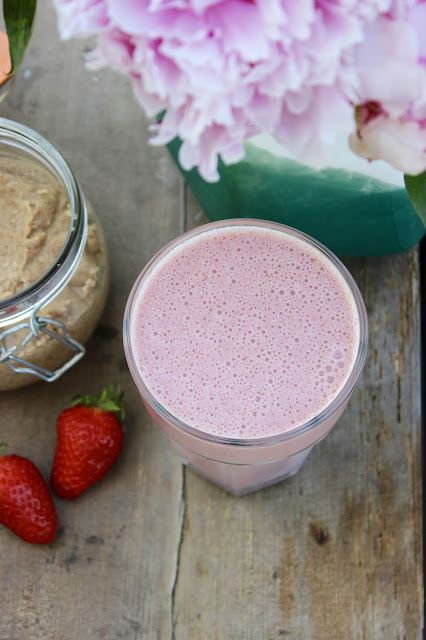 This is the latest version I've been making, which incorporates a tablespoon of my Almond and Coconut Butter along with a little coconut oil, which combined with the strawberries and bananas simply tastes like summer! Whenever I'm asked what my essential piece of kitchen equipment is, I answer a food processor. In reality, I love my kitchen gadgets and there are others which some may consider non-essential but which I use so regularly that it's hard to contemplate being in the kitchen without them (my citrus rasp is up there on the list of "can't-live-withouts"!). That said, a food processor really will make this way of eating an absolute breeze. It's hard to imagine being without one. I love the versatility of what can be created using a food processor. Aside from handy time savers such as grater attachments, the standard blade makes light work of creating raw desserts & treats, energy balls, pestos, dressings, hummus and other dips, falafels and burgers, and pasta sauces such as this vegan friendly "cheese" sauce. This Mac' and Cheese is creamy, flavourful and indulgent. I've always thought of Mac' and Cheese as the ultimate comfort food- perhaps in part because of its nostalgic quality. This is no exception- although it has added feel good factor thanks to the inclusion of B12 rich nutritional yeast. What's more, it packs in a hidden vegetable through the butternut squash but I sometimes add a handful or two of spinach to up my intake (the lemon juice in the sauce will help in the absorption of iron from the spinach too). Normally, I'm all for mindful eating but this dish begs to be eaten slovenly in comfy clothes whilst having a relaxing evening! 1) Preheat oven to 180 degrees C.
2) Place the butternut squash in a roasting tin and drizzle with the olive oil. Roast for 25-30 minutes. 3) Boil the pasta in a large saucepan as per the packet instructions. Drain and return to the saucepan. 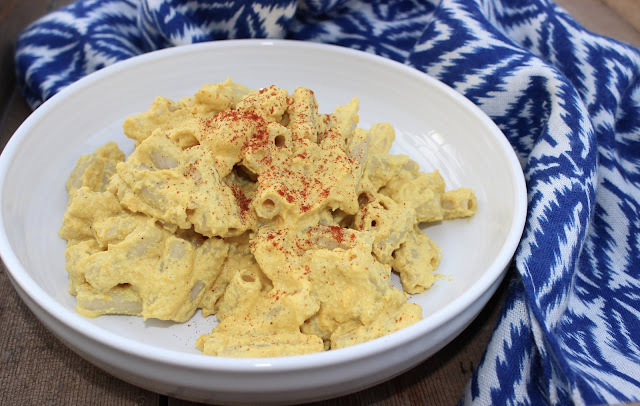 4) While the pasta is cooking, whizz together the cashews, butternut squash, garlic, almond milk, nutritional yeast, lemon juice, turmeric and salt & pepper in a food processor until smooth and creamy. 5) Pour the "cheese" sauce over the pasta and stir to thoroughly combine. Sprinkle with a little paprika to serve. I like making my own nut butters but it's actually been a while since I last created a recipe for one. 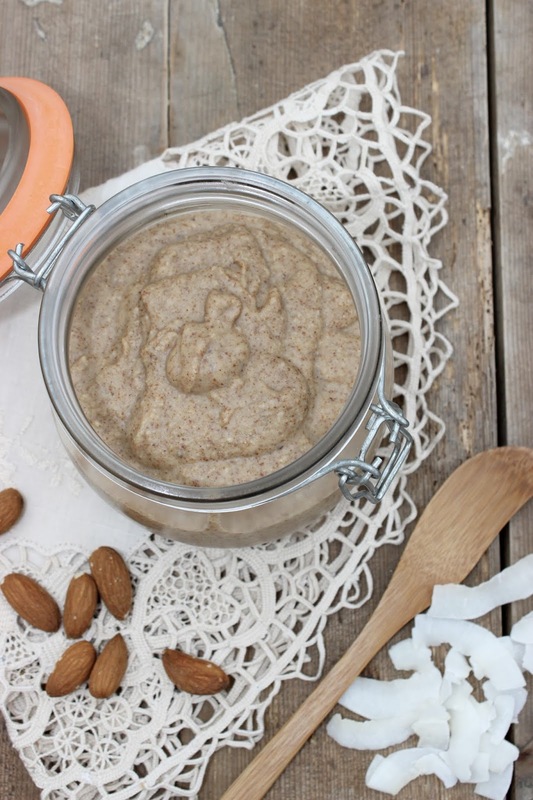 I decided to add coconut to the classic almond nut butter to give a summery twist. This tastes incredible on its own or with raspberry chia jam on top of toast, waffles, smoothie bowls, pancakes or porridge but for an added sense of indulgence, I also like to add a sprinkle of cacao nibs when using it. Three great health benefits: promotes healthy skin, beneficial for bone health, energy boosting. 1) Place the almonds in a food processor and whizz for approximately 1 minute, until they resemble crumbs. 2) Add the coconut flakes and salt and whizz until smooth, creamy and glossy. The time this takes will depend upon the power of your food processor and may require patience (mine took approx 10 minutes). It's important to pause every minute or so to scrape down the sides of the bowl and also to prevent the motor from overheating. I've posted quite a few curry recipes now but I wanted to create a milder version for those who can't tolerate spice. Personally, I rarely opt for korma (growing up with a South American mother has given me a pretty high spice tolerance!) but this particular recipe was inspired by my PT & friend, Alice, who doesn't like spicy foods but told me that she wants to be more adventurous in the kitchen. 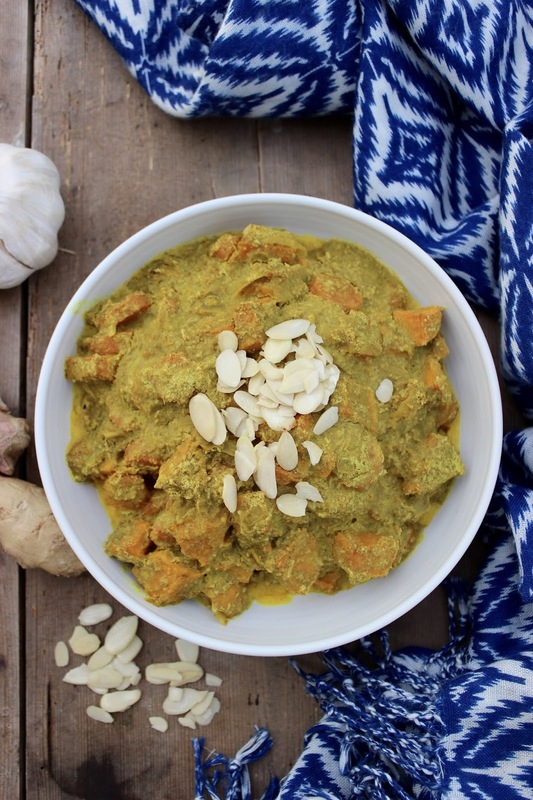 I hope that this will inspire Alice and others alike to try out this healthy twist on the classic Korma which tastes fragrant & flavourful (& even if you're a spice fiend like me, it's so yummy & easy to make that it's worth giving a try!). I like to serve this with quinoa as a lighter option than rice because it already contains carbs with the sweet potato. 1) Warm the coconut oil in a large saucepan over a medium heat on the hob. Add the onion and lightly fry for a few minutes until softened. 2) Next, add the garlic and ginger and cook for a further minute, stirring constantly. 3) Stir in the spices (turmeric, garam masala, cumin, ground coriander and chilli) and cook for a further minute. 4) Add the carrot and sweet potato and stir, ensuring that they are covered in the spice mixture. 5) Add the coconut milk and simmer over a medium heat for 10 minutes, stirring regularly, before adding the desiccated coconut & ground almonds. Season with salt & pepper. Stir and simmer for a further 5- 10 minutes until the vegetables are cooked through. Sprinkle with the flaked almonds to serve. I love aubergines and generally always have one or two in the fridge, especially at this time of year when they are in season. I've previously raved about their versatility. This extends to their inclusion in salads too where their "meatiness" makes for a more substantial and satisfying dish, with this flavour-packed warm salad being the perfect example. I've included an easy dressing which incorporates cashew butter- it's ideal for those times when you crave a creamy dressing but don't want to wait for cashew nuts to soak. Three great health benefits: beneficial for brain health, good source of fibre, boosts immunity. 2) Place the aubergine in a roasting tin and season with salt and pepper. Drizzle with the olive oil, ensuring that all of the aubergine pieces are evenly coated. Roast for 20 minutes. 3) Meanwhile, make the salad dressing by whisking together the cashew butter, extra virgin olive oil, lemon juice, Dijon mustard and salt & pepper. This will make more dressing than you need but you can keep the excess in an airtight container in the fridge. 4) Place the rocket in a serving dish or bowl and top with the warm aubergine, walnut and pomegranate. Drizzle with the dressing. Enjoy immediately.